Hide Folders 2009 is a simple but ingenious program for Microsoft Windows XP and 2000 users. Every day we trust our personal files to a computer. Who knows how many people will want to get access to them? If you share your computer with co-workers, children, spouse or your computer is always connected to the Internet, your private files are under threat of being revealed. Since 2001, our Hide Folders software products help our users to hide private files and folders from prying eyes. - Nobody but you will access your hidden folders. - NTFS, FAT32 and FAT volumes are supported. - Unlimited number of folders can be protected at the same time. - Trusted processes support - processes which are permitted to access the protected data. - No file system structure modifications will occur. - Effective password protection when running program. - Effective password protection when uninstalling program. - Removing Hide Folders 2009 folder from the system will not uncover hidden folders. - Files from hidden folders will not be lost even if someone tries to remove an upper-level folder. - Clear recent documents option. Hide Folders 2009 clears records of recently accessed documents if these documents reside in the hidden folders. - Clear Recycle Bin items originally located in hidden folders. - Secure Hide Folders 2009 by removing itself from the list of mostly used programs (Windows start menu). 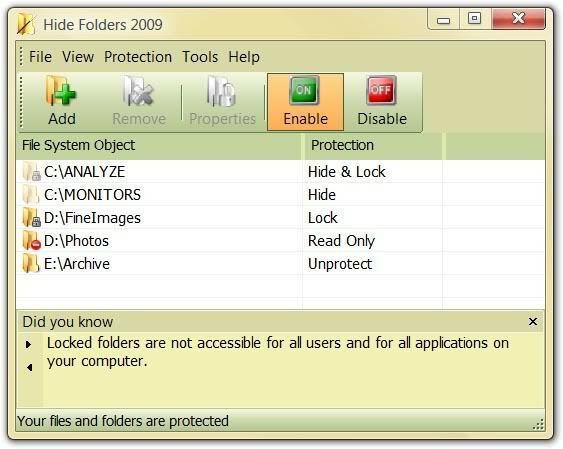 - Secure Hide Folders 2009 by removing itself from Add/Remove software Control Panel applet. would not bring the system down. - True stealth mode - you cannot detect the program with Windows Task Manager. - Safe mode support - The folders can be hidden even if your computer is running in safe mode. - Hot keys to manage basic Hide Folders 2009 functions. - Command line support of all main Hide Folders 2009 functions. - Support of folders named with national language symbols . - Hide Folders 2009 is multilingual software, its user interface supports different languages and can be easily translated to new languages. - Intuitive and extremely easy-to-use user interface with visual styles support.